Climate change has assumed dramatic dimensions – but can it also be rendered on stage? Natalie Driemeyer, dramaturg, describes how differently this theme is treated in theatres internationally. Theatre can be a place of self-assurance, a part of cultural memory and also a venue for dealing with urgent problems in society. Plays touch people at a direct, emotional level and can function as an indicator of the local significance of a particular theme. In this sense, what role does anthropogenic climate change play in theatre around the world? One thing is certain: the more the countries in question are affected by the consequences of climate change, the more the theme is treated on stage. Climate change is usually discussed with regard to how greatly it affects people, how it confronts them with particular issues and problems or causes community conflicts. “Climate” plays are often based on real conflicts which are artistically merged with fiction and dramatized. Dramatists also update mythological stories on the basis of changing living conditions, and sometimes the people affected tell about their lives. The Lab Teater Ciputat from Jakarta, for example, works with the inhabitants of the Indonesian island of Pulau Panggang on the consequences of the rise in sea level. For centuries these people have used theatre as a means of expression, as a way of reporting on their relationship with nature. Having spent weeks out at sea, the fisherman go to theatre rehearsals. In their current productions they deal with such problems as the loss of their already restricted habitat, the salinity of their drinking water and the conflict involved in possibly struggling to preserve their homeland or going elsewhere in search of survival. The Teatro Tierra in Colombia informs its audiences about the consequences for their local climate of huge wood clearings by using the popular tool of acrobatics, including traditional culture and by using a language rich in symbols. 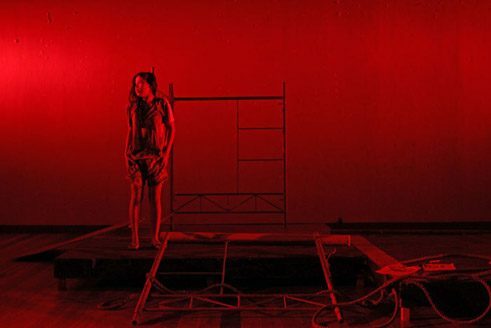 The Little Theatre on the Philippines stages the experiences of those who, in the face of the inexpressible, have become speechless, fallen silent. In their production image / a / nation, the group deals with the question of how a society can redefine itself after a catastrophe. The PETA, Philippine Educational Theater Association, works with survivors by helping them to break through the physical and psychological bonds of their collective but individually experienced trauma by means of anti-trauma workshops conducted together with psychologists. Many theatre groups form a lobby with their audiences so as to draw attention and to jointly demand their rights from politicians. In so doing, they often sound out new artistic possibilities. Only a few theatre people in Germany are working on this theme, usually taking a conceptual approach. Rimini Protokoll, for example, analyses the (power) structures of climate conferences in their project Welt-Klimakonferenz at the Deutsche Schauspielhaus Hamburg. During their performance Cooking Catastrophes choreographers Eva Meyer-Keller and Sybille Müller along with Michelin-starred chefs “cook” familiar media images, culinary scenarios shaped by environmental catastrophes and wars. They thus mirror the distanced, rational aspect of our everyday reception of catastrophes. Theatre festivals such as Odyssee : Klima at the Stadttheater Bremerhaven in 2013 or the congress Save the world at the theatre in Bonn in October 2014 illustrate the diversity of the theme, while the small number of authors usually work with children’s and youth theatre groups, i.e., with a generation who will be greatly affected by the changes in the future, also in Germany. Only rarely, however, are there real “nature plays” in which nature, and nature only, is the performer. One case is Tobias Rausch’s long-term botanical theatre project Die Welt ohne uns (The World without us) at the Staatsschauspiel Hannover, in which, over a period of five years, he showed how dramatic plants can be. That anthropogenic climate change and the conflict between nature and man are not only dramatic but also quite theatrical becomes evident from the multifaceted works of the theatre people in the different climate regions. Global society is about to face one of its greatest challenges, one which will have an enormous impact on the preservation of peace. The stories staged in theatres offer audiences the chance to gain a very personal insight into local problems. The language of theatre links people worldwide, and international networking has the potential to enable visions of a just future to be worked out jointly and irrespective of national borders and interests, coalitions to be formed, and mutual responsibility to be taken. Natalie Driemeyer is a free-lance dramaturg who, in the framework of a research trip, examines how theatre people worldwide deal with anthropogenic climate change in their productions.